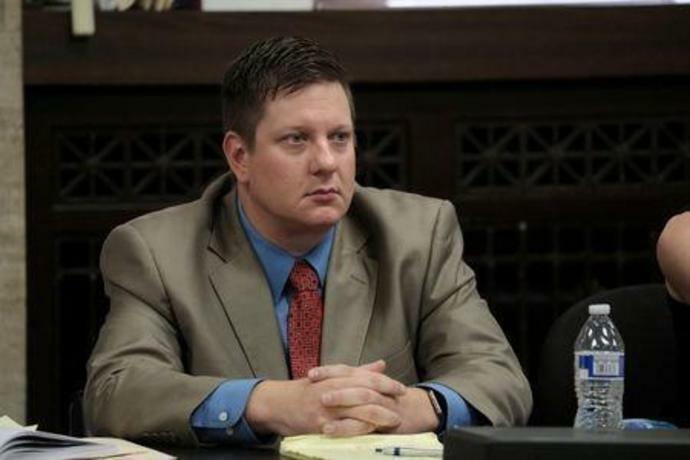 CHICAGO (Reuters) - Illinois Attorney General Kwame Raoul and a prosecutor on Monday challenged the sentence of former Chicago police officer Jason Van Dyke for the murder of a black teenager, questioning whether the judge who imposed it followed the law. Van Dyke, 40, who is white, was sentenced last month to nearly seven years in prison for second-degree murder in the shooting death of Laquan McDonald in 2014 in a landmark case that highlighted racial tensions in America's third-largest city. Cook County Circuit Court Judge Vincent Gaughan did not sentence Van Dyke for the aggravated battery conviction, explaining that second-degree murder was the more serious crime. Raoul and Kane County State's Attorney Joseph McMahon, the special prosecutor in the case, told a news conference that they had a filed a petition to the Illinois Supreme Court to review the sentence imposed by Gaughan. Van Dyke could appeal the petition, they said. "This is a question of the law. And it is in the interest of justice that the law be followed no matter who the defendant and no matter who the victim is in a particular case," Raoul said. A spokeswoman for Van Dyke's lawyer said there would be a news conference on Monday afternoon to address the challenge. At the sentencing hearing, prosecutors argued Van Dyke should be sentenced for the aggravated battery with a firearm convictions, McMahon said in a statement emailed on Monday. "The ability for the prosecution to challenge a sentence is very narrow, but this might be one of those situations," McMahon said.